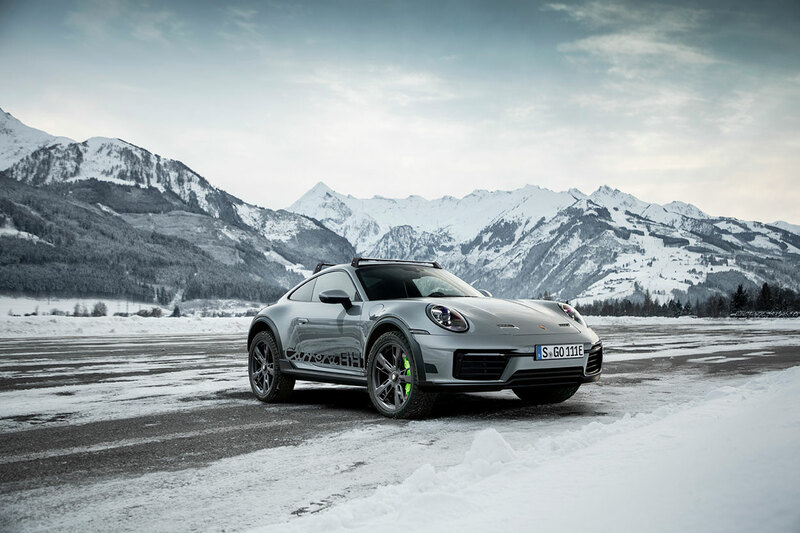 Porsche is ready to take its sports cars to new heights, specifically 30 millimeters higher with the new 911 Carrera Rallye Hybrid concept, an exploration of creating “lifestyle” cars that fill niche markets between the normal Carrera line and the high-performance GT cars. The Carrera RH is meant to be a modern interpretation of the recent off-road “Safari” air-cooled 911 builds, which today have wide acceptance in the Porsche community. The car was also inspired by Porsche’s own endeavors in rally racing — one of the first factory-supported overall victories for the 911 came at the hands of Vic Elford driving a 911T at the 1968 Monte Carlo Rally, and Porsche continued to develop off-road sports cars such as the 911 SC/RS and the 959 supercar for World Rally Championship contention. Yet in spite of inspiration coming from the past, the RH could point the way forward, in part because it is the first road-going 911 to feature a gasoline-electric hybrid drive system. With the introduction of the 992-generation 911, on which the RH is based, Porsche conspicuously built into the eight-speed dual-clutch automatic the possibility of pairing it to an electric motor, and here the engineers have delivered with a 134-horsepower unit that makes 295 pound-feet of torque, likely the same motor in the Panamera 4 E-Hybrid. Combined with the 443-hp, 390 lb-ft Carrera S flat-six, total output is 568 hp and 547 lb-ft. Unfortunately there would be no option for a manual transmission were the RH to be produced because there’s no way for it to accommodate the electric motor. Porsche did not mention fuel economy, but even with the raised suspension and knobbly tires, the automaker says the 0-60 miles-per-hour time should match the Carrera 4S’s 3.2 seconds when using launch control. Why isn’t it even quicker with a more than 100-hp advantage? The electric motor, front-mounted lithium-ion battery, and ancillary components have increased weight to 3,917 pounds, making it 430 lbs heavier than the Carrera 4S. To charge the batteries, the RH can be plugged into a charging station, recuperate energy from the brakes when slowing down and through clever reuse of hot exhaust gases, and even absorb energy from the sun via a new roof with a built-in solar panel. Perhaps the easiest way to tell the RH is a hybrid is by the Acid Green brake calipers — all of Porsche’s hybrid vehicles come standard with brake calipers in the bright color. Those who’ve been paying attention to the development of Porsche’s Taycan EV will notice some design cues taken from the Cross Turismo concept (which is now slated for production), including two small slits in the hood containing LED rally lights, and black plastic fender lips and side skirts, which are both durable and cheap to replace should they be damaged during an off-road excursion. The wheels are also similar in design to those on the Cross Turismo concept. Porsche’s roof transport system makes an appearance as well, which can be equipped with a roof box, bike rack, and more. Porsche’s President and CEO Oliver Blume recently admitted in an interview with Evo that the company would be exploring limited- and special-edition 911s as part of a new lifestyle pillar for of the model range based on the success Porsche experienced selling special editions of its GT cars (think 911R, GT3 Touring, etc.). Apparently the 911 Carrera RH is just the first of these cars for the 992 generation, and we hope Porsche produces it or something very similar. But one thing is for sure: April Fools!